Along with the latest quiff hairstyles, this new inspiration gallery shows a wide range of contemporary beard styles! When deciding on your favorite look, you need to be aware of your face-shape to choose the most flattering type of quiff. Roughly speaking, a high quiff adds balancing height to a round or chubby face or a low forehead. 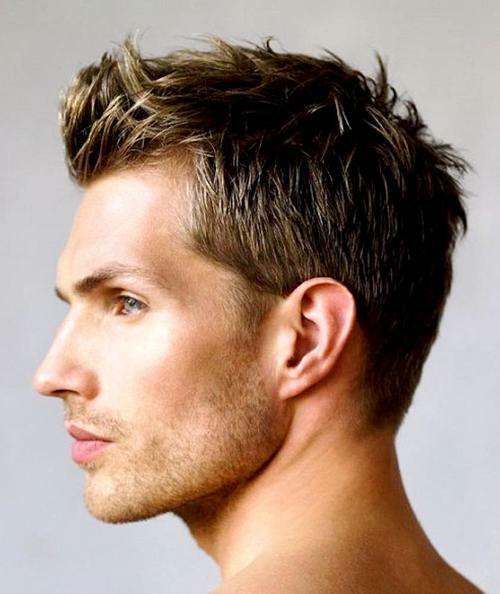 But long or thin faces look more balanced with volume at the sides and a low quiff. Whatever your face-shape is, you’ll find a totally trendy look right here among these 20 latest quiff styles! The key to this look is good grooming, because you need to keep everything trimmed and perfectly styled when you embark on the adventure of a full beard! 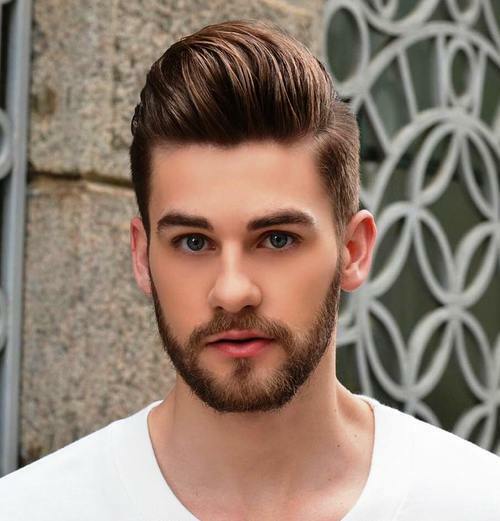 The look is well balanced and creates the oval outline that’s considered the perfect face shape – with the gently rounded quiff being the top of the oval and the bearded chin the bottom. This is a more playful quiff that’s slightly asymmetrical and reflects the relaxed personality of the model. The lightly ruffled line of the quiff keeps it casual and fine blonde highlights add texture and movement to a dynamic, youthful look! This trendy look suits wide or round face shapes well. The spiky quiff adds flattering ‘height’ and the shaved sides help to ‘narrow’ facial width. The line of the beard emphasizes cheek-bones and covers any fullness in the cheeks/chin. 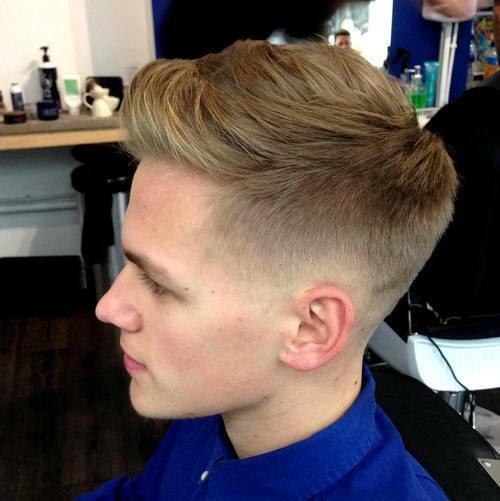 Trendy blonde highlights in the quiff add extra style and draw the eye up to a focal point at eye-level. This model has a long face shape, which is subtly ‘shortened’ by the close-cut beard and sparse mustache. 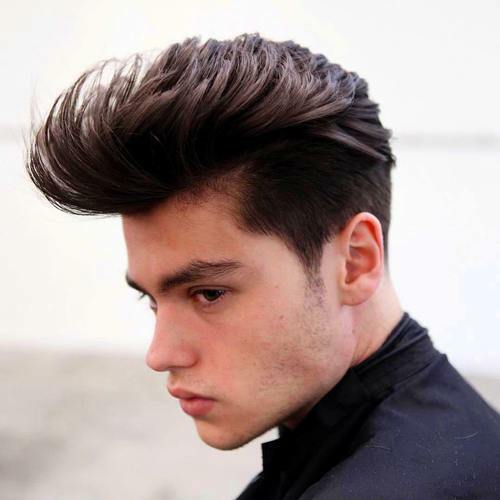 The sides add width, and blunt-cut tips on the vertical quiff create a thicker look. This ash-blonde, tousled quiff has subtle white-blonde highlights creating texture and 3-D volume on fine hair. 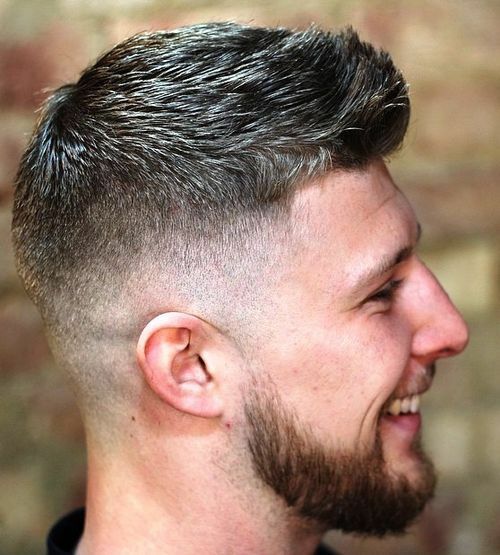 This short-back-and-sides mohawk cut on thick hair uses the density to create interesting textures and contrasting movement. The high quiff helps ‘lengthen’ a low forehead and the hair is fixed in place with matte styling product for an edgier finish. If you prefer a longer hairstyle, why not try a vintage bouffant quiff which adds lots of height on top. 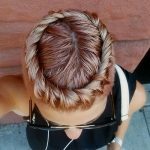 The mohawk roll balances out a short forehead really well and this very stylish look has a cheeky pin-curl at the front! With a flamboyant pink patterned shirt, tie and vest, this model is showing the high-powered executive look. The haircut is suitable for thick hair and the high quiff ‘lifts’ a low forehead. The sides and back are left fairly long to keep the outline classic, but blonde highlights add lots of contemporary style. 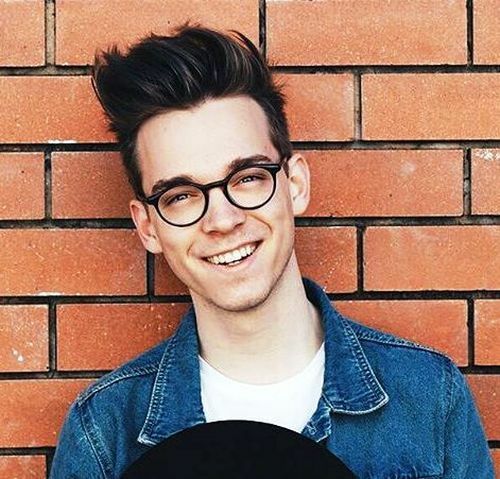 This is an edgier, contemporary quiff that’s cut longer on top and shorter around the sides and back to create an edgier contrast. 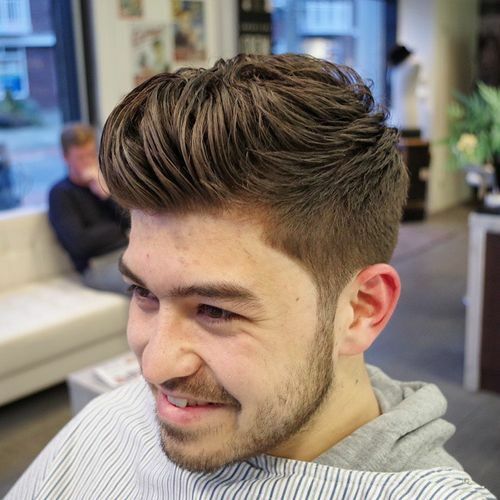 The profile shows-off the short clipped ‘fade’ around the ears and modern styling products allow the long quiff to be fixed in a flipped-up, ‘windswept’ look! Here’s the original quiff hairstyle popular in the 1950’s. It became the symbol of the ‘mixed-up kid’ rebellious teen generation and is still popular with guys who love the unique style of those days. 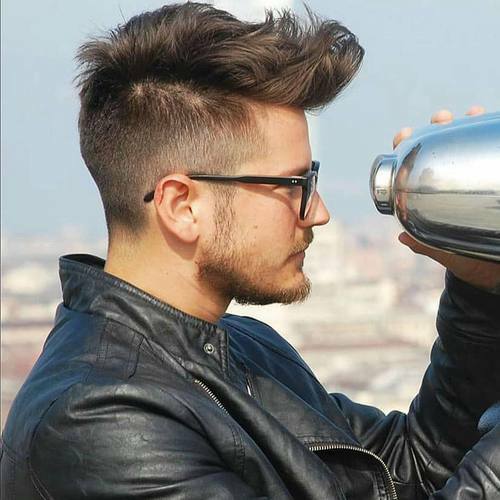 Modern styling products make it easier to create this impressive quiff, which makes a fabulous style statement! Non-conformist types look great with this natural-finish mohawk that’s suitable for hair with natural wave. The top’s cut in a tapered line from a short crown to a forward styled long quiff with a lightly tousled texture. The short beard, cut low on the cheeks in a beatnik-inspired line, finishes off a stylish, youthful look! Designer stubble adds an extra touch of masculinity to this model’s finely chiseled features. The hair is layered all through to create a softer look than shorter, shaved haircuts and make it easy to add volume and movement to fine hair. Forward styling is neatly topped-off by the short, stub-quiff above the forehead. Here’s an extrovert, celebrity look suitable for trend-setting, creative types. The clipped short-back-and-sides are bleached white, along with the long mohawk from forehead to crown. The free-standing goatee beard isn’t bleached to match the rest of the hair, which looks ‘out of kilter’ to me! 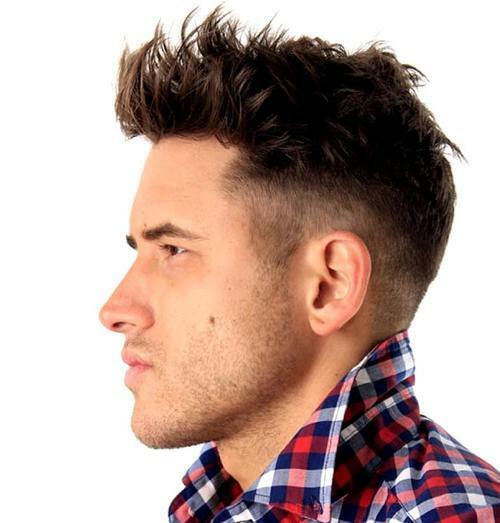 This tapered-tip haircut suits fine and medium hair and curly hair. 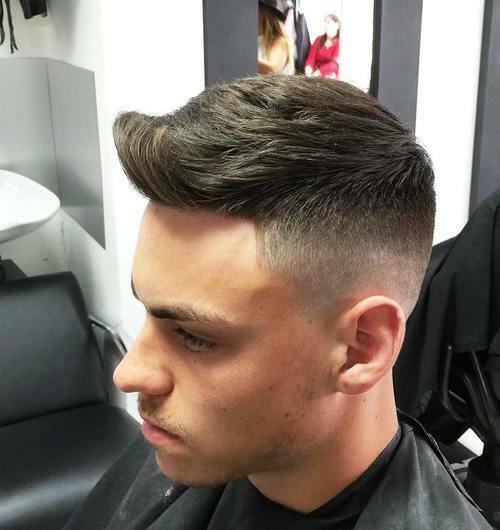 The top section is kept wide above the fade at the back and sides, creating a wider front outline to flatter a narrow or long face. A little ‘designer stubble’ on cheeks and neck adds masculinity to the look. 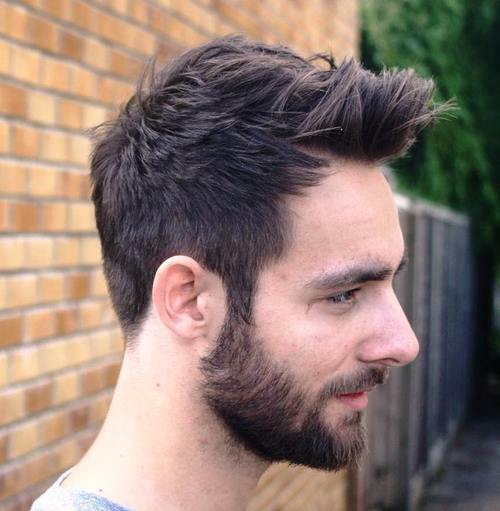 Thick, black hair looks great in this high-volume swept back look with longish sides connecting to the beard. The curves in the quiff soften the line around the forehead and the separate mustache gives as ‘cleaner’ look to the face. The beard continues to the neck and the ‘soul patch’ completes a trendy, manly style. This is a very well-defined Tin-Tin quiff decorating the front of a contemporary style with a triple-grade fade at the sides and back. There are no side-burns, leaving the cheeks ‘clean’ and the sparse mustache and goatee beard add interest without the heavy look of a full beard. This clean-cut look is trendy, but not too extreme and creates a classic well-groomed look. The low quiff is swept-over to one side from a side parting, and lots of clever texture has been styled into the hair. Add to this a color-fade from light-brown to ash-blonde in the quiff and you’ve got a stylish and contemporary haircut! 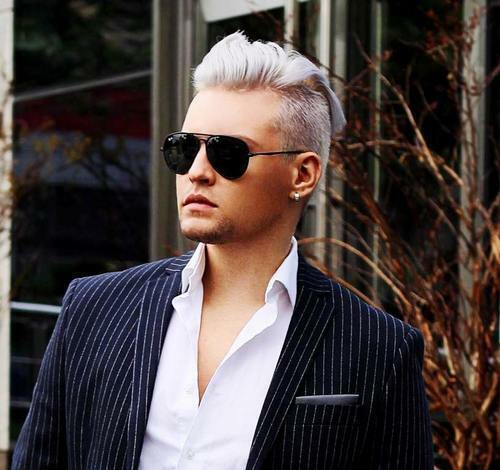 Silver-gray hair is one of this year’s big hair fashion hits, and this guy’s joined a hot male trend for ‘gunmetal’ hair color. 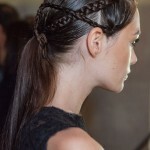 It’s a metallic, gray shade that catches the light and really enhances short cuts with textured layers. The short quiff with blunt-cut tips makes hair seem thicker. 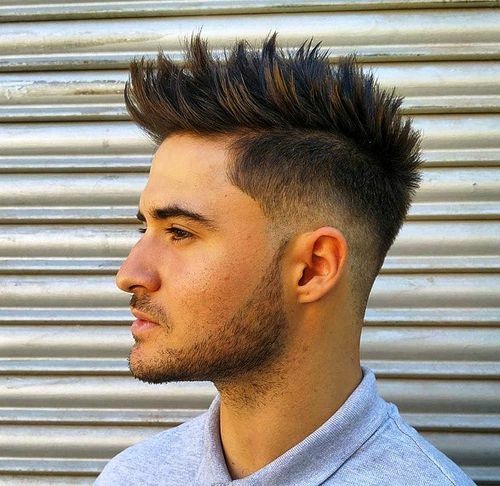 Here’s another contemporary haircut that’s masculine and creates a highly-groomed image. The top hair is cut in expertly tapered tips and styled with an edgy, uneven outline for a ‘feathered’ mohawk. Closely-clipped side-burns connect to a shaped beard with clean cheeks, that’s continued on the neck for a masculine vibe. This is a more rugged, outdoors man look with lots of short layers cut in the sides and back. At this length, you can style the sides in a trendy, forward line to cover a receding hairline if necessary. 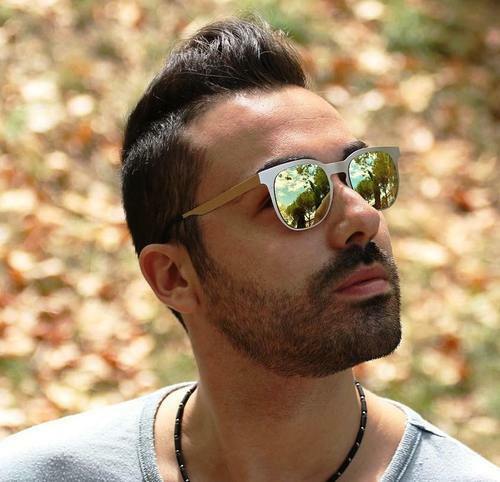 The quiff is worn in a rounded wave above the forehead and the tousled finish, plus full beard and mustache, keeps the look casual. 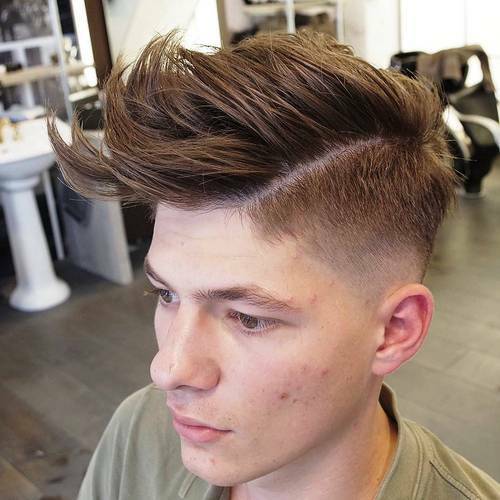 This smoothly styled, tapered pompadour creates a well-groomed and trendy image. The sides are short and combed downwards into side-burns joining the clipped beard that’s shaped at the cheeks and neck. 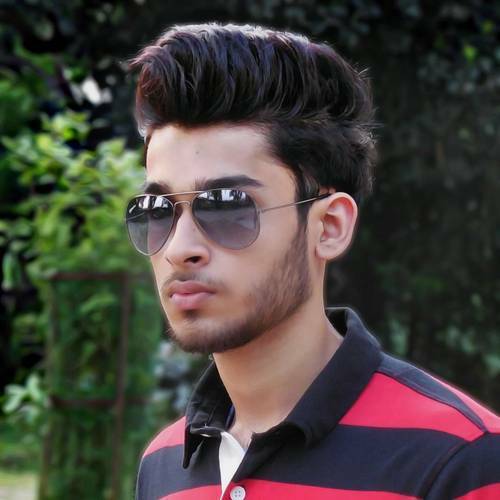 This guy’s hair and beard are perfectly maintained, suggesting a fashionable guy with individual style! So have you found a great new style? 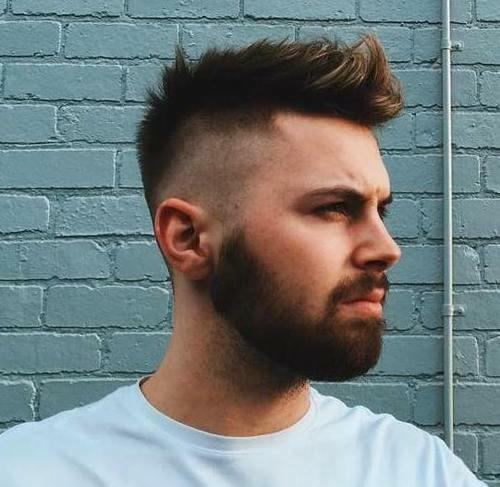 Take a selection of your favorite quiff haircut and beard styles to show your stylist and get expert advice on which one will make you look absolutely fabulous!